I'm a full-grown child of the 1970's and 80's now making good on the detail that consistently appeared in my childhood vision of my adult life. I'm writing for pleasure, but now am doing it by blog rather than (or in addition to) the emails, notes and essays I have written for years just because it feels like breathing to me. I'm a full-time worker outside the home, and an all-the-time wife and mom of two boys, 9 and 14 years old. As such I throw a lot of footballs, shoot a lot of hoops, deliver a lot of lectures, swear more than I ought to, thank a lot of teachers and coach a few teams. If I'm your friend, neighbor, coworker or the person you met at the park, I am probably the one whose story was a bit too long, though hopefully entertaining. Remember, I'm happy to return the favor. I do love a good story, and I don't just mean my own. This entry was posted in Funny Story, Humor and tagged Humor, Imagination, Pregnancy, Pregnancy test, Starbucks, Target, UP & UP. Bookmark the permalink. I’m not sure what it says about me, but my brain went immediately to something more like the last version. Except it was a teenager with a hidden Target habit she learned (inheirited? I truly believe there must be a Target gene) from her mother who then ran into said parent while on her way to check out. I can only imagine the panic as she scrambled to come up with a valid reason for being there – to hide both the need for the pregnancy test and the fact that she and her mother might be more alike than she wants to admit. Obviously the need for a new wrist strap thingy was the only option. If only she’d been closer to the shoe aisle. Love! And I had a similar first thought (minus the spot on Target gene subplot) that some teen girl was there with moral support friend. 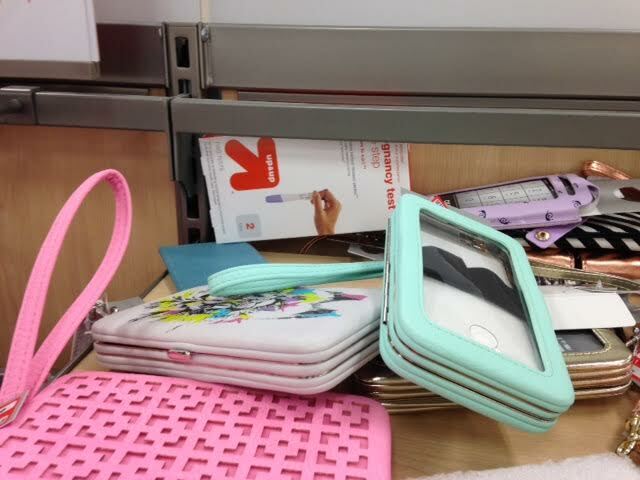 Moral support friend spotted the girl’s mom with a, “Lisa, your MOM…!” and the wrist purse was bought. Oh, so funny that it would’ve been luckier if she were by the shoes. Thanks for playing!